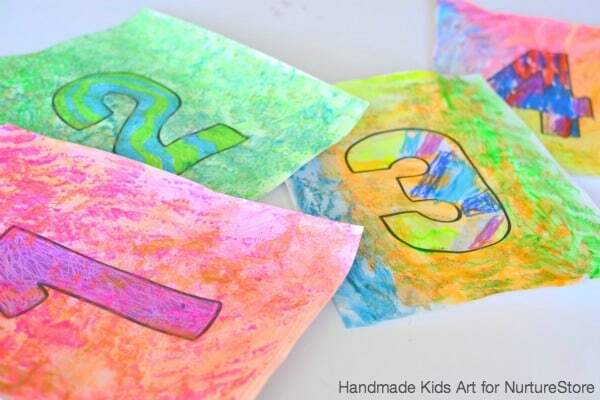 Please welcome Jamie from Handmade Kids Art to our ABCs and 123s letter and numbers series. She’s sharing how to combine math and art for a hands-on way to explore numbers, inspired by the artist Jasper Johns. 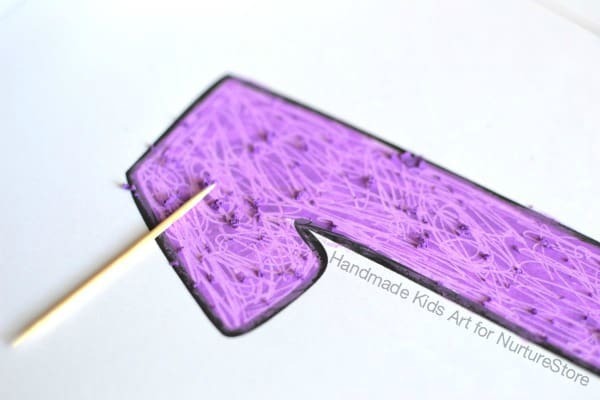 Hi, I am Jamie from Handmade Kids Art. I help busy parents and educators find time to raise creative kids through STEM, or what I like to call “STEAM” activities. STEAM is the combination of Science, Technology, Engineering, Art, and Math. The inclusion of adding Art to the STEM core subjects is essential to encouraging your child’s creative and critical thinking. 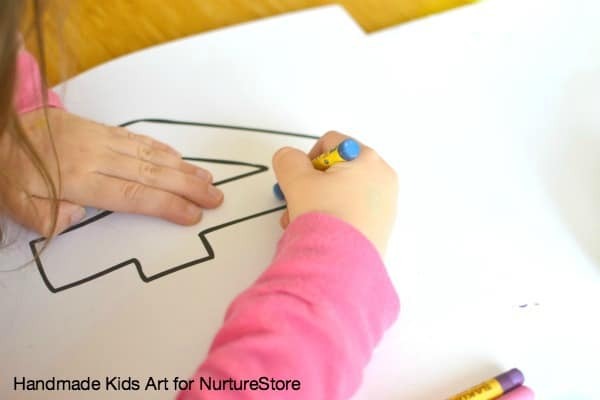 STEAM activities help support your child’s curiosity, creativity, and innovative thinking. This STEAM activity combines math and art and is inspired by the artist, Jasper Johns. Jasper Johns is an American artist known for his series of paintings based on numbers. 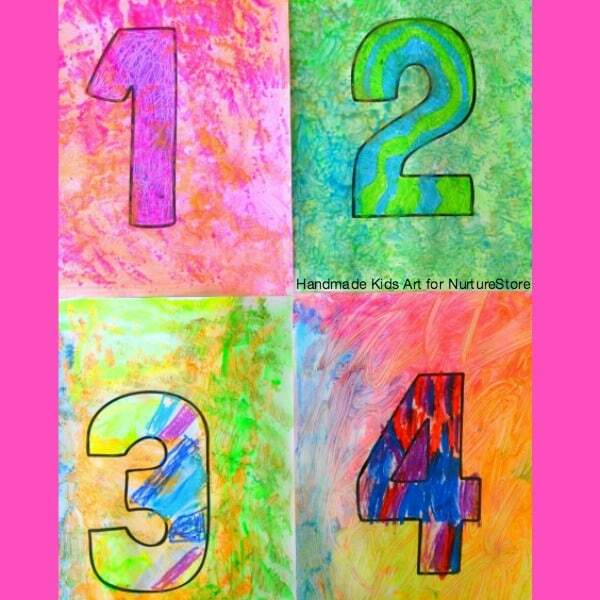 Create your number inspired painting while working on 1:1 number correspondence. Step 1: Print out or draw a large number on cardstock paper. Fill in your number with the corresponding number of colors. For example, select one color for number one, select two colors for number two, three colors for number three, etc. 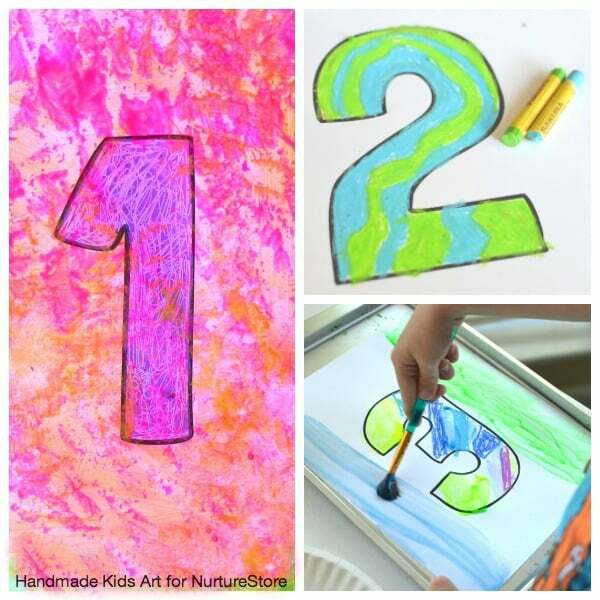 Challenge your older child to create a pattern using the corresponding number of colors. Step 2: Once your number is colored entirely add line and texture to your drawing by carving into the oil pastel with a toothpick (if you used crayon you may skip this step). 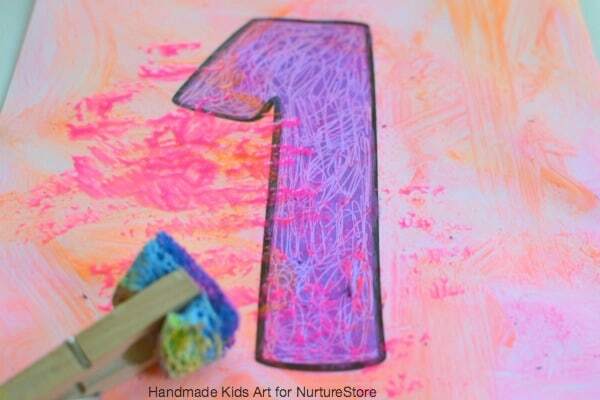 Step 3: Paint over your number with watercolor paint. Notice, the paint does not stick to the oil pastel or crayon. This technique is called a resist. The paint resists sticking to where the oil pastel is placed. Step 4: This step is optional, but to add more texture to your painting, use a sponge brush to add more texture and color. Let the painting dry. Step 5: Share and display your work of art. 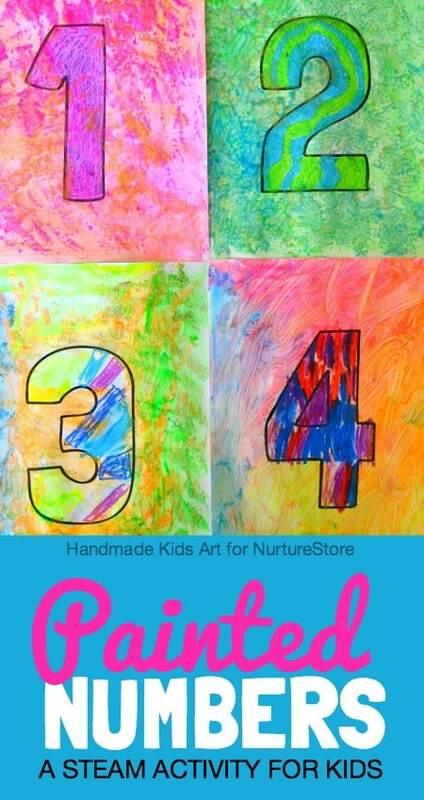 Try creating a series of numbers or create with friends to build a collaborative work of art of numbers 0-9. 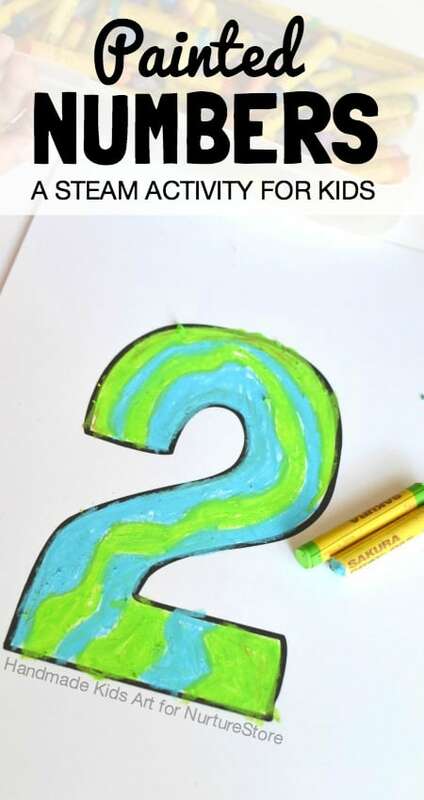 To view more STEAM activities you can do with young children be sure to sign-up and receive our free download, 3 STEAM Activities You Can Do Today with Your Young Thinker! Jamie is a Certified Art Instructor and a mother of three. 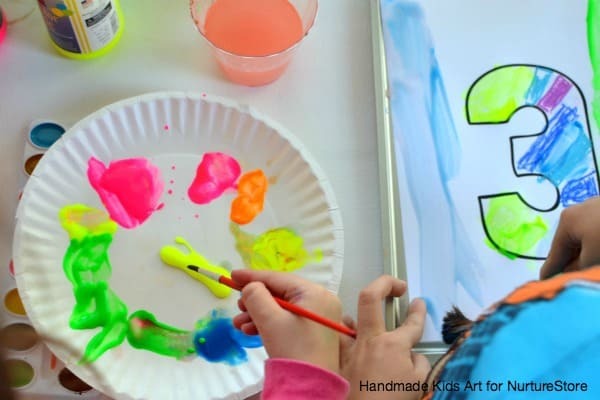 Her website, Handmade Kids Art, focuses on quick, easy and inspiring STEAM activities to grow creative kids. It doesn’t matter if you only have 5 minutes or 20 minutes, you can find time to create with your children. You can follow along with her STEAM-filled adventures at Hand Made Kids Art, Pinterest, Facebook, Instagram, and Twitter.